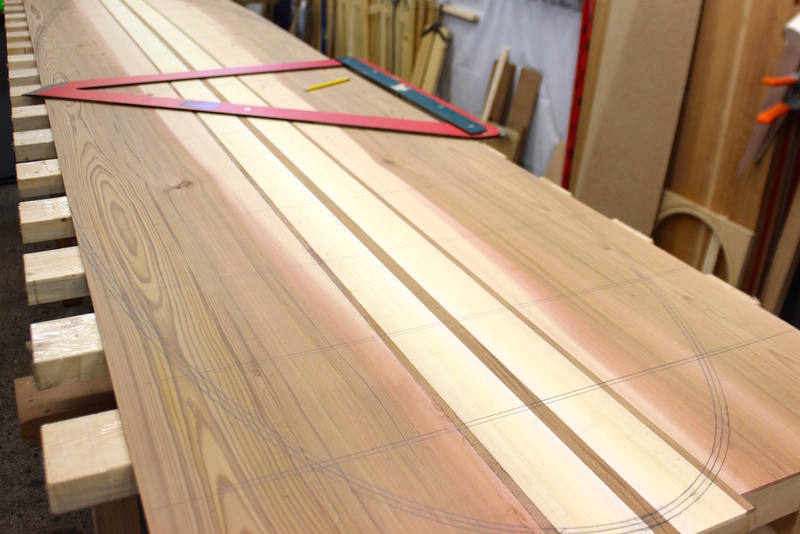 The next step in building a hollow wood paddleboard is flattening the panels. If you were careful gluing your panels it is pretty easy to get them flat. The panels (skins) should be flat but they do not need to be perfect because they will be sanded after they are on the board. Sliver Paddleboards has the luxury of having a 37″ thickness sander so most of the images you see in the tutorials look pretty close to perfect. 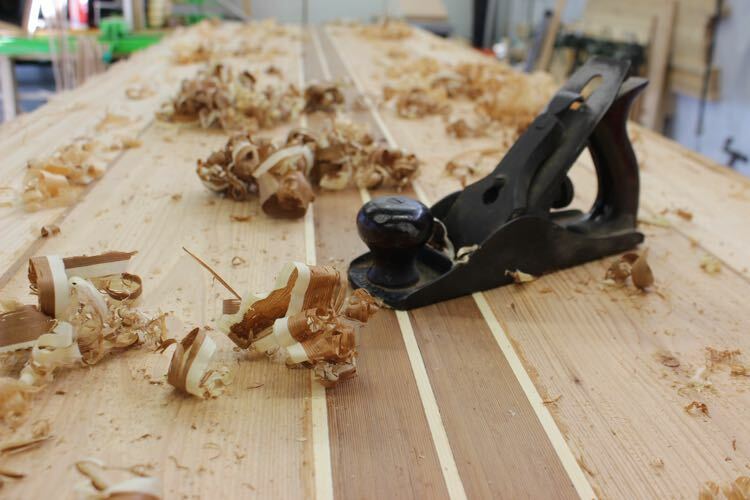 You do not need to get you panels as smooth if you are doing this step by hand. The morning after gluing the panels will look something like this. You can see in this image the panels are pretty flat and there isn’t too much squeeze out on the side that will show. 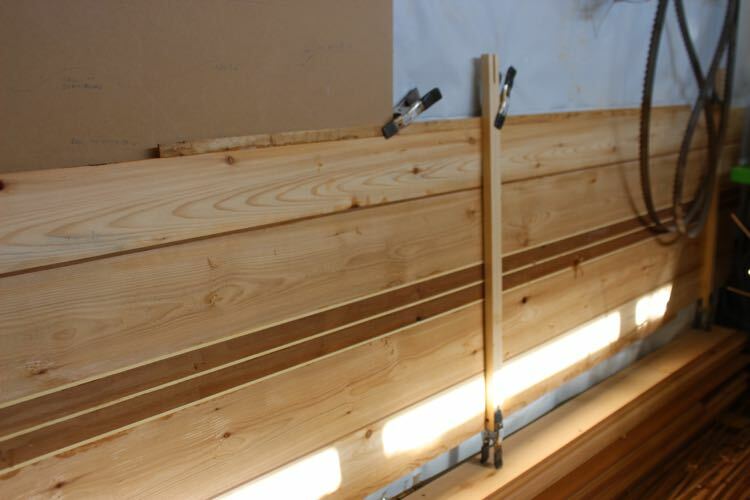 The bottom side of this panel looks about the same as I clean up the squeeze out after all the clamps are tightened. With everything looking fairly flat you can check the thickness of the panel. I recommend not going any thinner than 4.5mm on the bottom skin and 5.5mm on the top skin. 6.35mm (1/4″) is about the thickest panel that will bend nicely without steam. 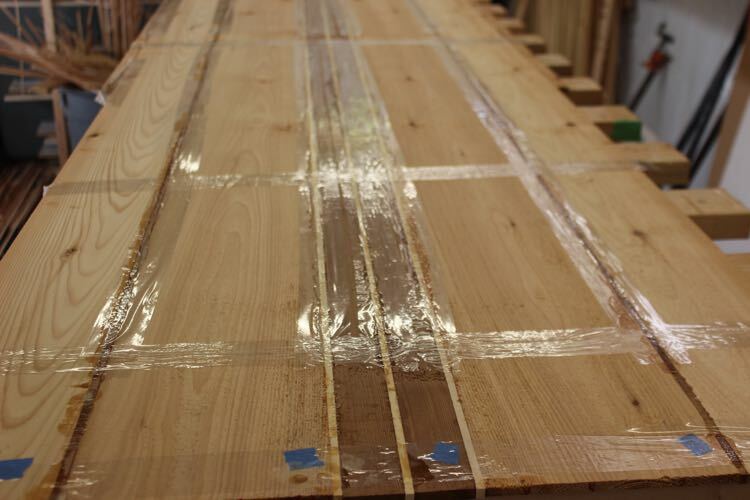 The key to bending wood is using thin wood! The image above with shows a flat panel being checked with the sole of the plane. There is no need to do anymore planing on the inside surface but you might consider sanding the surface that will show. With a thickness sander I rough sand my panels to 60-grit before the board is built. This sanding saves time and ensures that finished board is as light as possible. At home you can achieve the same results by using a fairing block by wrapping a full sheet of sanding paper around a 2×4. It is much easier to get a flat surface if the block is long. Store the panels with the bad side facing out to protect them from damage.